I probably would have never found out about Sushi Hub had they not followed me on Instagram. 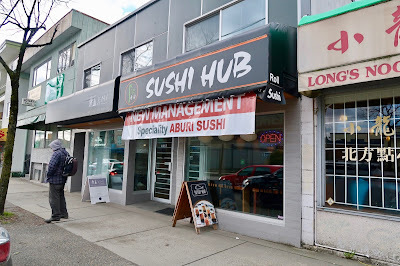 Located on one of the less busier parts of Main Street, the restaurant makes it quite obvious that its feature dish is Aburi sushi. As soon as I returned the follow, half of my Instagram feed was filled with delicious-looking photos of fusion sushi from Sushi Hub. I took this as a sign that Instagram was persuading me to try the restaurant and got Tamsen to join me for lunch. The restaurant is not very large, but the dining area appeared clean and in order. I suppose word about this restaurant had not really spread, as it was not packed even during peak lunch hours. As such, we had a comfortable amount of room at our table. 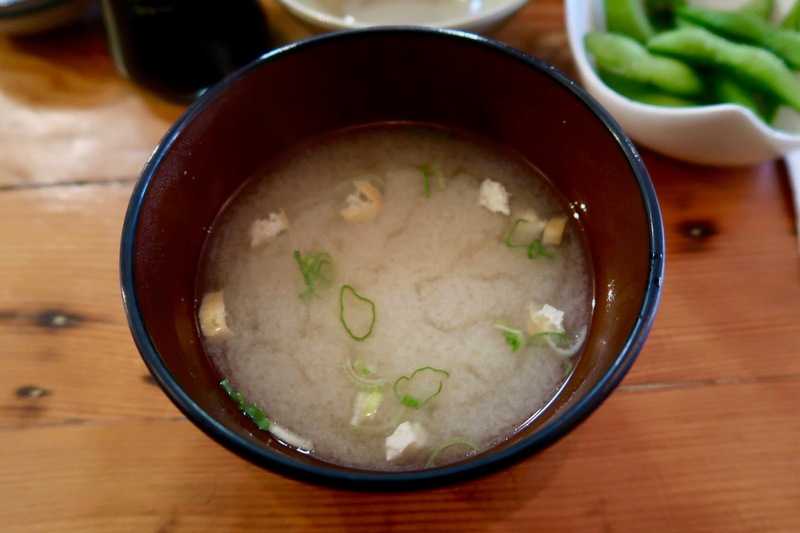 Since we ordered an Aburi Box, we were entitled to one miso soup. However, they were nice enough to give us two. Served hot, the Miso Soup came with green onion and bean curd and was well-balanced. 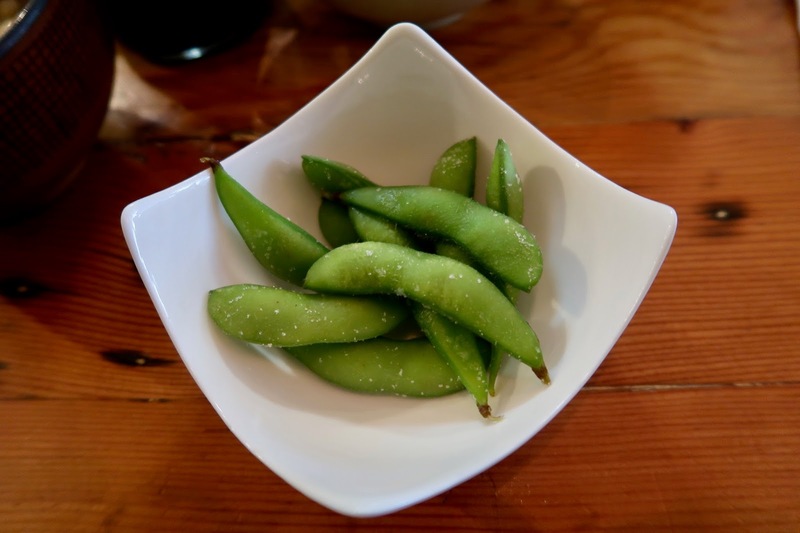 The daily special that came with the Aburi Box was a small serving of edamame. These were salted and tasted fresh with sufficient moisture. Next up, the Salmon Sashimi was buttery and creamy with a pleasantly smooth texture. The slices were not particularly large, but the cutting was on point. 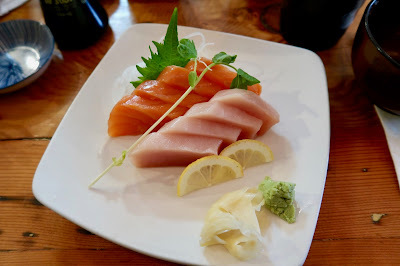 The Tuna Sashimi was very soft and refreshing. 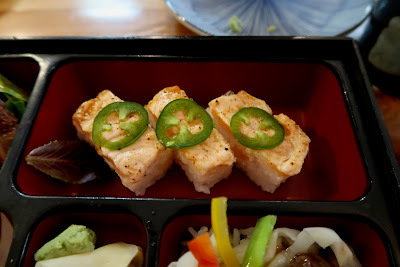 There was some peculiar pricing going on, as the Aburi Box ($11.50), which contained 3 pieces of Aburi Salmon Oshi Sushi, cost less than an order of 6 pieces of Aburi Salmon Oshi Sushi ($12.50). Since it was lunch time, it didn't make much sense to get an order of Aburi Salmon Oshi Sushi, so we opted for the Aburi Box. The Salad was comprised of mixed greens and came with rather little vinaigrette. Although this made the Salad slightly too dry, perhaps this was a good thing because the vinaigrette was oddly salty. The main feature, the Aburi Salmon Oshi Sushi, came with thinly sliced pieces of seared salmon, which were graced with huge, honking slices of jalapeño. Although the seared salmon had a nice smoky flavour, the jalapeño was quite overpowering and brought death and havoc to our poor tongues. I also found the oshi slightly rice-heavy. 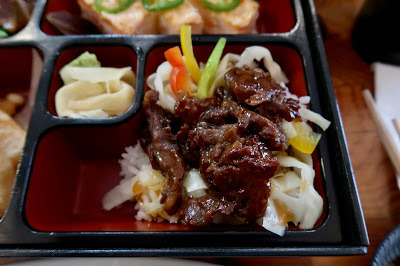 The Teriyaki Beef was sweet and helped bring our tongues back to life. The beef was tender, though sliced thickly in some places. The steamed rice underneath was well-prepared. 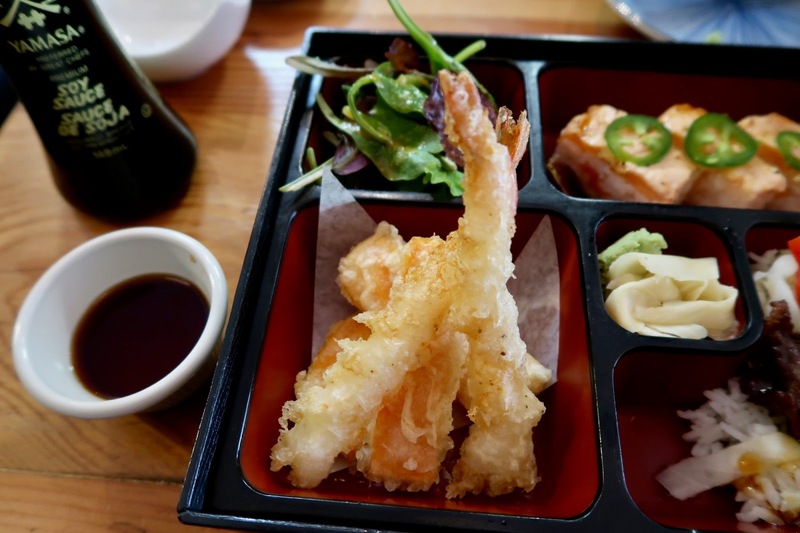 With a light layer of crispy batter, the Tempura was one of the better items in the box. There were 2 juicy prawns along with 3 small pieces of yam. The prawns were excellent, though the yam could have used a little more moisture. Of course, our visit wouldn't be complete without trying one of the hubs (their code name for special rolls). I wanted to go for the Barbie Hub (for obvious reasons), but I couldn't convince Tamsen that having asparagus in a roll works if done right, so we went for the Volcano Hub instead. 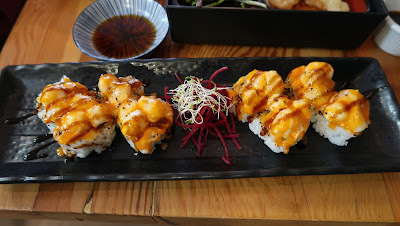 With crab meat, avocado, chopped scallop, spicy mayonnaise, and sweet sauce, the Volcano Hub came with some really soft scallops. The roll was quite sweet with a delectable, cheesy layer on top. 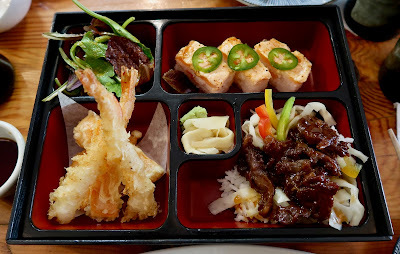 Overall, the service was reasonably friendly, and the food was reasonably consistent. 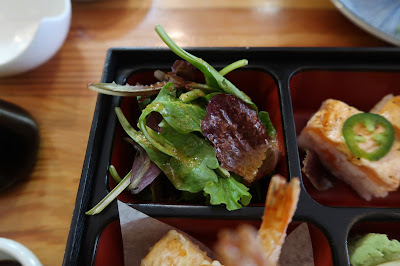 However, the food didn't exactly have the wow factor suggested by the restaurant's Instagram photos. 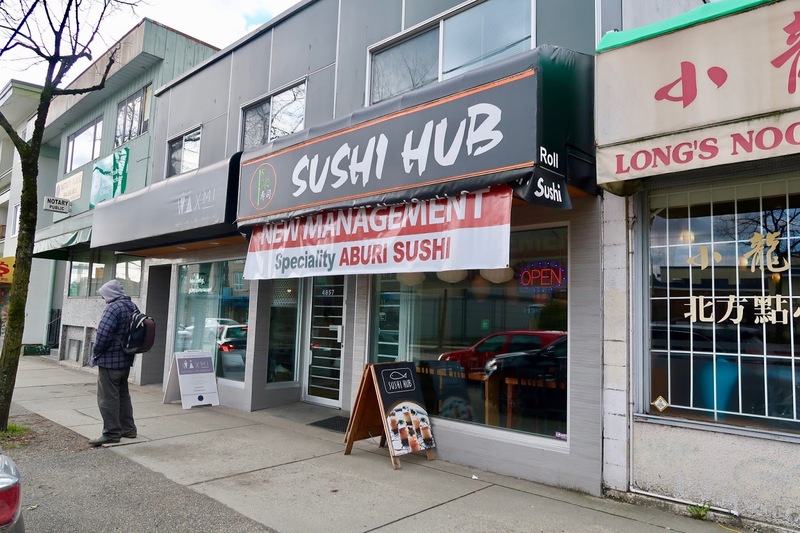 With average prices and slightly above average food, Sushi Hub would have to do more to perfect its Aburi sushi before attracting crowds.